Diehard San Francisco Giants fan; unfiltered and politically incorrect liberal; professional musician and journalist and aspiring baseball announcer. The Boston Red Sox made quite a bit of noise during the second day of Baseball's annual Winter Meetings in National Harbor, Maryland, as they acquired Tyler Thornburg, Chris Sale and Mitch Moreland. The day started off with the Red Sox trading Travis Shaw and two prospects to the Milwaukee Brewers for right-handed relief pitcher Tyler Thornburg. 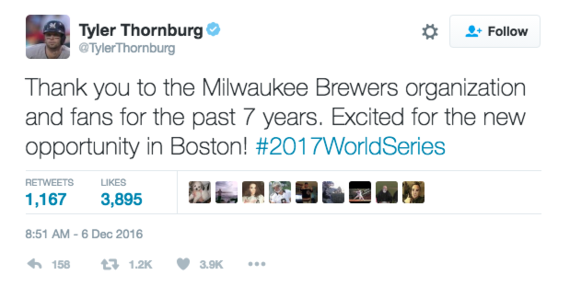 Thornburg pitched 67 games for the Brewers last season, in which he went 8-5, with a 2.15 earned run average. 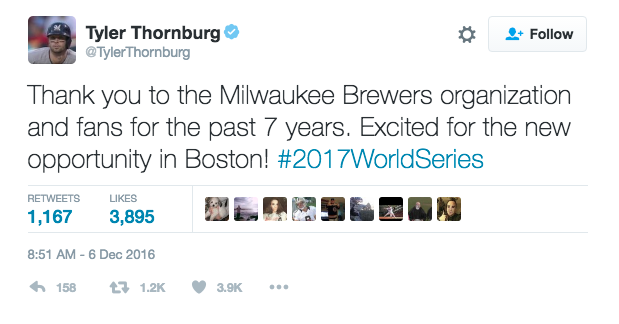 Thornburg was quite stocked about the trade, as his tweet about the traded ended with "#2017WorldSeries." 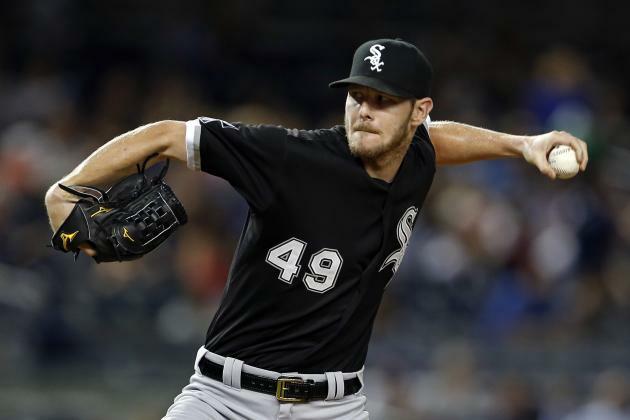 The Red Sox were just getting started, as they completed a trade with the Chicago White Sox for left-handed starting pitcher Chris Sale. In return, the Red Sox sent Yoan Moncada, who is ranked as baseball's number one prospect by mlb.com, as well as three other prospects to Chicago. Sale further strengthens a rotation, which includes 2012 American League Cy Young Award winner David Price and 2016 American League Cy Young Award winner Rick Porcello. Sale is a five-time all-star, and he had 74 career wins in his seven years with the South Siders. He also has a career earned run average right at three. Sale made headlines on July 24, when he cut up all of the throwback jerseys that were going to be used in that night's game, in which he was slated to pitch. He did so, because he didn't like how the style of the jerseys made him feel on the mound, so if the Red Sox can avoid throwback nights to their very early championship seasons of the early 20th Century, they should be fine. Speaking of interesting headlines, Pablo Sandoval was the next highlight for the Red Sox. Manager John Farrell said that Sandoval would be in the mix to play third base for the Red Sox next season. Farrell also said that Sandoval had lost a considerable amount of weight. 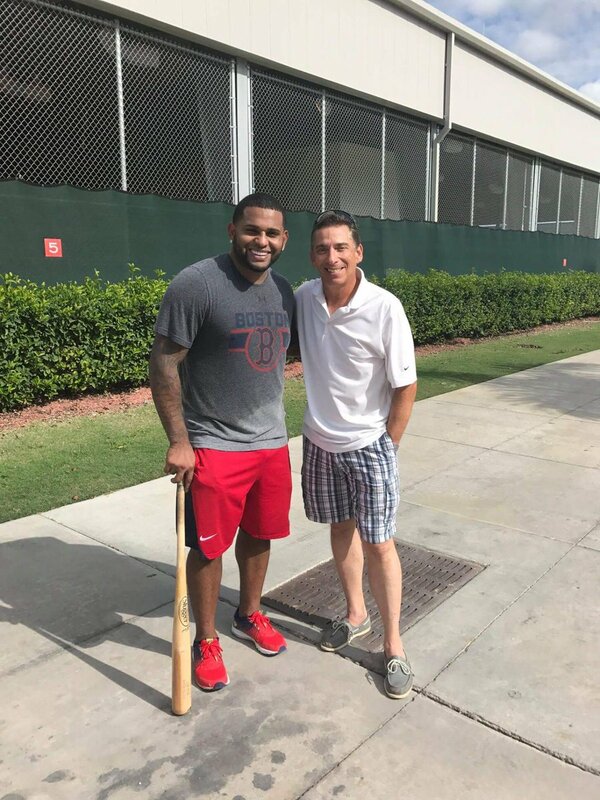 A recent picture then surfaced confirming that Sandoval not only indeed lost a considerable amount of weight, but that he was in the best shape of his life. Sandoval, 30, had a miserable season for the Boston Red Sox in 2015, which was his first of a five-year, $95 million contract. When Sandoval showed up to Spring Training, he had obviously put on a considerate amount of weight. He hit just .245, with 10 home runs and 47 runs batted in. Sandoval then showed up to Spring Training last season, appearing even heavier. Sandoval went 0-for-7 in his first three games last season, and he broke his belt on a swing he took in a game in Toronto. Those three games turned out to be his only three games of the season, as he was sidelined for the remainder of the season, following left shoulder surgery. Now, Sandoval appears to be in the best shape of his life, and if he shows up to Spring Training in the same shape, he could be poised for a comeback season unlike none other. When Sandoval was in shape, he was one of the best players in baseball. He displayed power and could hit anything thrown to him at the plate, and he displayed tremendous defensive range at third base. To top the day off, the Red Sox agreed to terms with power-hitting first baseman Mitch Moreland on a one-year deal, worth $5.5 million. Moreland, who hit over 20 home runs in three of his last four seasons, will likely enjoy the short dimensions down Fenway Park's right field line, which includes famous Pesky's Pole, which stands only 302 feet from home plate. 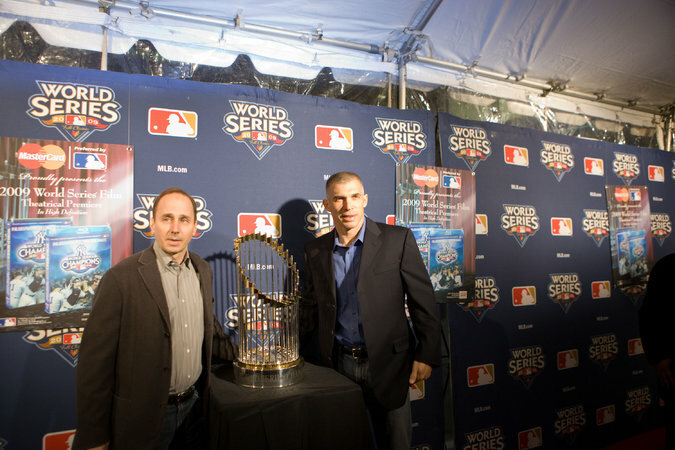 "Boston's like the Golden State Warriors now in Baseball," said New York Yankees' general manager Brian Cashman in an interview with Newsday's Erik Boland. "They got their Durant and their Green and Thompson and Curry. Of course, Cashman is no stranger to offseason shopping sprees. Prior to the 2003 season, he acquired Japanese superstar Hideki Matsui and Cuban defector Jose Contreras. A year later, coming off a loss to the Florida Marlins in the 2003 World Series, Cashman signed six-time all-star right-handed starting pitcher Kevin Brown, as well as Gary Sheffield. Cashman capped off that offseason with the trading of Alfonso Soriano to the Texas Rangers for Alex Rodriguez. Prior to the 2005 season, in the wake of their historic loss to the Boston Red Sox in the 2004 ALCS, Cashman was at it again, as he signed the Big Unit and now Hall of Famer, Randy Johnson. Cashman's biggest shopping spree came during the 2008-2009 offseason. The Yankees missed the postseason, entirely in 2008, which was the first time they had done so since 1993. The team was also moving into its new version of Yankee Stadium, so Cashman wasted no time. He traded for Nick Swisher, and then he signed CC Sabathia and Mark Teixeira. Cashman's moves paid off, as each of them had their moments in the Yankees' run to a world championship in 2009, which was the franchise's record 27th title. There are some indications that Cashman may be prepared for another spree. The Yankees called up catcher Gary Sanchez, who had an unbelievable 53 games, as he hit .299, with 20 home runs and 42 runs batted in. Sanchez's performance gave the Yankees a lot of hope for the future. On Sunday, the Yankees agreed to a one-year, $13 million deal with veteran power hitter Matt Holliday to be the team's designated hitter. 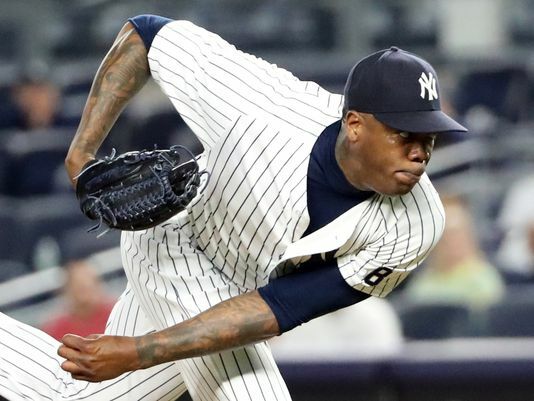 The Yankees have also expressed significant interest in bringing back Aroldis Chapman, who was the team's closer in the first four months of last season. The Yankees have offered contracts to both Chapman and Kenley Jansen. If the Yankees can sign both pitchers, they would have the best backend of a bullpen in baseball to go along with Dellin Betances. The Yankees had the best backend of a bullpen in baseball last year with Chapman, Betances and Andrew Miller. Who knows, had the Yankees kept Chapman and Miller and still called up Sanchez, and had the Giants been able to get Mark Melancon at the trade deadline, a Huffington Post Contributor's infamous Giants and Yankees World Series prediction could have come true. It would be quite a day for the Yankees if Chapman and Jansen both signed, and that could certainly make the Yankees the team of the third day of the Winter Meetings. These potential moves could put the Yankees in a good position to return to the postseason, as the American League is shaping up to be quite weak next season. 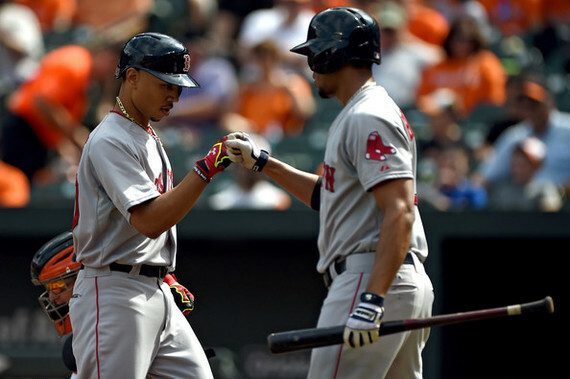 However before the Red Sox made their big moves Tuesday, they already had a monstrous offense, which featured Mookie Betts, Xander Bogaerts, Dustin Pedroia, Hanley Ramirez and Jackie Bradley Jr. Add Moreland and an in-shape Sandoval to that mix, and all of baseball better look out. Not to mention that the Red Sox already had good starting pitching and a good bullpen. Some could say that the Red Sox have already won the entire offseason. Of course, winning the offseason often times doesn't mean that much once the actual season starts, and in the 22 years of the Wild Card Era, only four teams who finished the season with the best record in baseball went on to win the World Series. However, it would take something incredible to prevent the Red Sox from winning the American League East again, as they have too much talent to disappoint.